Today we’re serving you a healthy dose of knotted hairstyles that you can wear all over town. Some are super duper casual — like the top knot coming to you from the Sazan blog, or the Bohemian Festival Knot at A Beautiful Mess. Others lean slightly more formal, including Christina’s Easy Knotted Hairstyle at Hair Romance, and Abby’s stunning knotted updo at Twist Me Pretty. Enough talk. Let’s get knotty! This is such an interesting look and one we haven’t seen before. That’s a testament to its uniqueness, especially considering we here at LH look at hairstyles on the regular. Anyway, the lovely Christina at Hair Romance breaks this pretty, and easy, knotted hairstyle down into eight straightforward steps. We think this would look great on all sorts of hair textures, so give it a go. We’re swooning over this delicate, half-up do that the ladies at A Beautiful Mess have created. 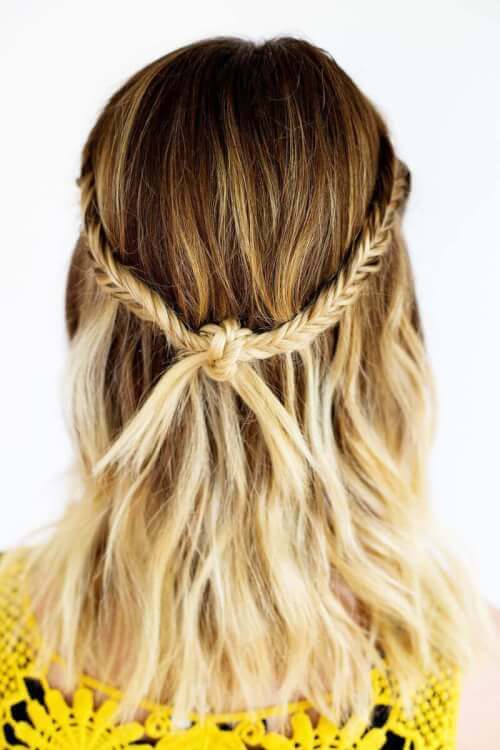 They’re calling it the Bohemian Festival Knot Braid, and it totally fits that summer festival vibe. Still, we think this knotted braid looks pretty post-festival season, and would transition well into the holiday party season. We’re thinking a killer winged eye, the reddest pout in the room and this gorgeous half up do. Here’s another pretty updo that’d be perfect for all your upcoming holiday events. This one is detailed by Abby at Twist Me Pretty, who lays out all the steps on her blog in both text form and via video. Abby recommends working with day two curls, as ” you want some type of texture in your hair so the style holds.” Note that this look will vary depending on your hair texture. Have fun with it! 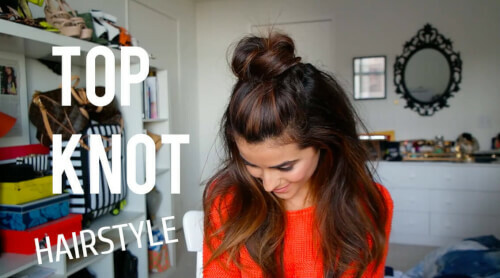 The top knot. It’s a classic, and for very good reason. Perfect for those casual, lazy days where you have to run a million errands, the top knot takes maybe two minutes to recreate and you’re ready to hit the door running. “It’s a go-to for me when I want to spice up my outfit with some extra added edge. It’s also been great on those bad hair days – I simply tie it up in a messy knot and instantly feel like my hair went from EEEEK to chic!” writes Sazan on her namesake blog. This list would be lacking if we didn’t include the Celtic knot. We’re not just featuring any ol’ Celtic knot, though. Nope — this is a double Celtic knot, and it comes to you from the mother daughter duo at the Cute Girls Hairstyles blog. There’s a video on the blog post that explains everything you need to know for recreating this, and they also include step-by-step written instructions. In addition to the double Celtic knot, they give instructions for the single Celtic knot and the side Celtic knot. 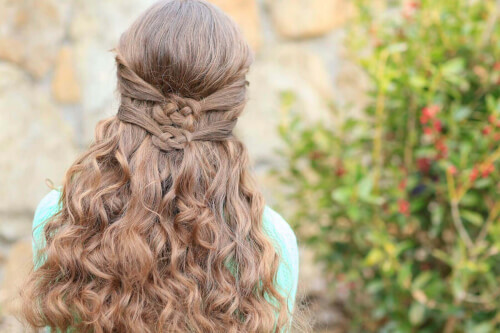 Love these knotted hairstyles? Check out Stop, Drop and Tuck: The Prettiest Tucked Hairstyle Tutorials.